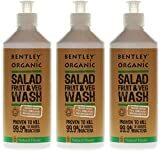 Great Deals & Offers On Bentley Organic – Salad Fruit & Veg Wash – 500ml . FREE Delivery On ALL Items. 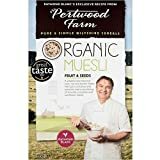 Our Organic Muesli Fruit and Seeds is a delicious and hearty blend of wholegrain cereals, fruits and mixed seeds, packed with valuable nutritional benefits. We take great care in ensuring that we grow the finest quality organic grains, because we believe good food starts with good farming. Seriously healthy, totally organic. Serving suggestion: our muesli is best served with cold milk (or even fruit juice), but you can also add fresh or dried fruit, fromage frais or yoghurt. Soaking it in milk or juice for a few minutes softens the grains.While we try to ensure that product information is correct, on occasion manufacturers may alter their ingredient lists. Please note actual image may vary. Information on this site is not intended to diagnose or treat any health condition. We recommend that if you are pregnant, nursing, have a medical condition or are currently taking medication that you seek advice from a health professional before you take any dietary supplement. Always read the product directions before use and do not exceed the recommended intake. Food Supplements should not be taken as an alternative to a balanced diet. Keep out of reach of children.